Men aren't exactly worried about the line of their suit when they need to wear snow boots; they simply want something that is rugged, reliable and the right price! Having said that, the advances in design, materials and technology have made men's snow boots an incredibly versatile piece of footwear, even dare we say it, fashionable. 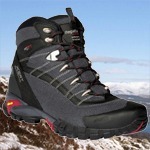 Unlike regular hiking boots men's snow boots have a much higher leg which is designed for walking through deep snow, but unlike the Wellington boot, snow boots have a variety of warm, breathable and waterproof linings or membranes that make the wearing of them a much more comfortable experience. 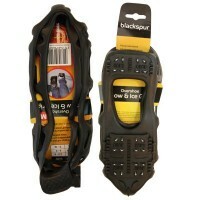 Most men's snow boots will consist of a rugged, deep cleated sole unit to counter compacted snow or icy conditions, a gusseted tongue so as not to allow water penetration through the eyelet or lace-up area at the front and a wellie boot or Canadian style foot unit for complete waterproofness. Some men's snow boots will also have a waterproof membrane or a waterproof outer coating which means that as well as being great in the snow and slush they're also ideally suited to typical British wet winter weather. Good quality men's snow boots will also have a thermal insulated lining and sometimes this is removable for washing purposes. Insulated linings obviously provide excellent warmth in the most severe of conditions and are manufactured from a variety of products ranging from, synthetic foam foam through to natural sheepskin. In addition to the more obvious uses, men's snow boots also have a variety of other applications and are particularly popular with people who work outdoors or or simply enjoy low level trekking in challenging conditions. When it comes to price, like everything, you get what you pay and at the top end of the spectrum we have something like the Olang Centauro Men's Snowboot which has a full oiled leather upper with a rugged reinforced rubber heal and toe area and a high leg and features the Olang OC System which is a clever hinged device on the sole of the boot which allows the wearer to open up a flap on the sole when doing so a serious of small spikes are revealed which are great when walking on ice. Down the price spectrum are the Trespass Yetti Mens Snow Boots, which will provide exceptional performance for the price and be a great addition to every man's outdoor footwear collection.